It's never a bad year to be rich, exactly. But 2017 turned out to be a particularly good one. Rich people are doing so well these days that their spending on luxury goods isn't even keeping up. Luxury spending rose 5% globally in 2017, the management consulting firm Bain & Company found. 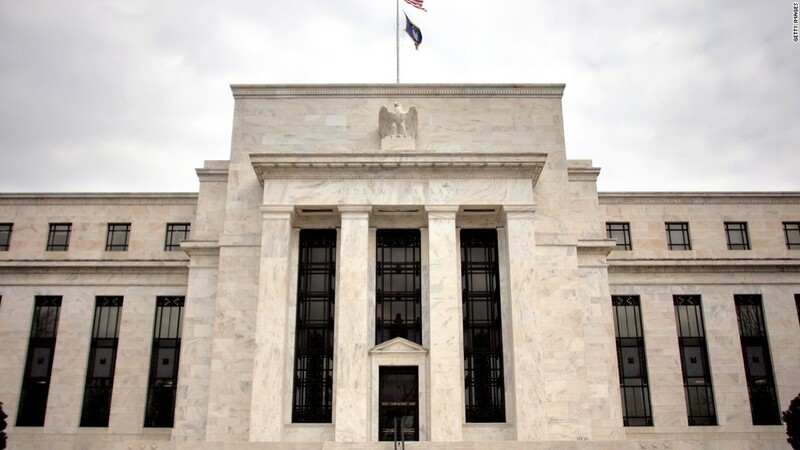 But that is a fraction of the 40% rise in net worth that people in America's top-tenth of income earners saw between 2013 and 2016, according to the Federal Reserve. "We used to see that the growth of luxury was closely correlated with the stock market," said Milton Pedraza, chief executive officer of the Luxury Institute, a consulting firm for high-end brands. "The stock market and real estate have gone up so much that nobody wants to spend all that money. It's impossible." The big increase in wealth has exacerbated a long-evolving financial split between those at the very top and those at the bottom, even as the robust economy has lifted many working people with jobs and higher wages. Here are some examples. The S&P 500 Index has risen 20% since the beginning of the year and the Dow Jones Industrial Average is up 25%, fattening portfolios and boosting dividends. To a certain extent, the benefits are shared through ownership of 401(k) accounts. But only about half of Americans participate in an employer-sponsored retirement fund, according to the Pew Charitable Trusts, and a much smaller 18.7% of Americans own stock directly. In both cases, market participation is skewed toward those with higher incomes, which means that the wealthy disproportionately benefit from Wall Street's boom. Home prices reached all-time highs, according to the Case-Shiller home price index. That's especially the case in hot markets like Seattle and San Francisco, where many working people are already unable to afford ownership. Although homeownership is a source of middle class wealth, homeowners generally tend to be higher-income. According to the Census Bureau, 78.4% of families making more than the median income own homes, compared to 49.5% of those making less. After-tax corporate profits set new records in 2017, reaching $1.86 trillion in the third quarter. At the same time, the share of the gross domestic product that goes toward wages remained near a recession-era low. That means workers are taking home less of the economic pie. 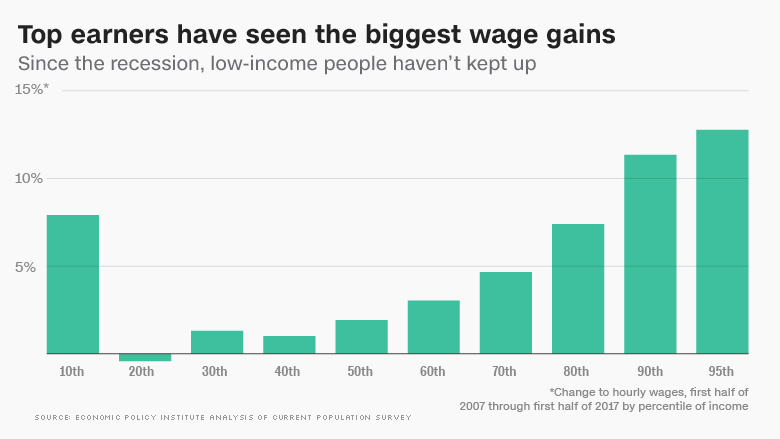 To be sure, there were signs this year that wages are growing for people on the bottom of the pay scale. But over the past ten years they've grown faster for people at the top. Meanwhile, mega mergers proceeded apace in 2017, furthering the trend of corporate consolidation that economists say allows monopolies to squeeze excess profits out of consumers. Some worry that the proposed union between CVS (CVS) and insurance giant Aetna (AET) could give the pair too much power to steer customers toward their own offerings, for example, and that chemical company Bayer's (BAYRY) acquisition of Monsanto (MON) could raise seed prices. The repeal of many Obama-era regulations by the Trump administration and congressional Republicans has been applauded by businesses, which say they will operate more efficiently and save money. It remains to be seen how much of such savings will flow down to workers and how much will go to investors. In one of the more high-profile rollbacks in 2017, the administration overturned the Consumer Financial Protection Bureau's rule against forcing consumers into arbitration proceedings. That was a win for financial companies, making it more difficult for people who've been wronged to seek redress. The Justice Department decided in June to back away from a measure that expanded the number of workers eligible for overtime pay, likely reducing the amount of money companies need to spend on wages. "These are all ways that are just allowing the top to garner higher incomes, and to push the costs on to the public," said Heather Boushey, director of the Washington Center for Equitable Growth, a left-leaning think tank. While the just-passed Republican tax plan cuts taxes for most lower- and middle-income people, it is particularly generous to people with high incomes and big bank accounts. 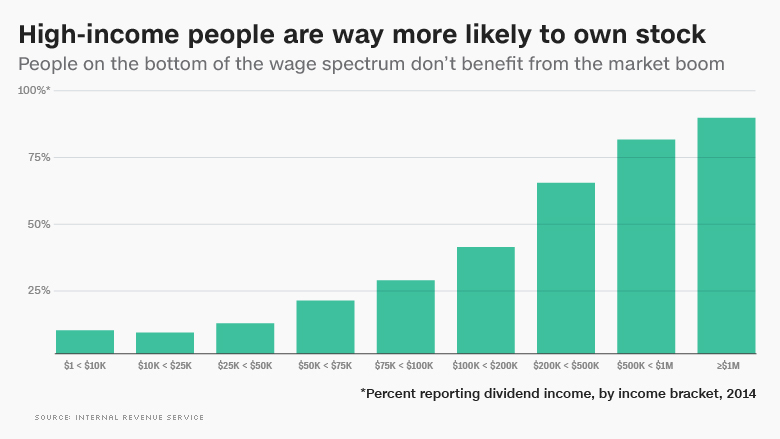 The Tax Policy Center estimates that a new 20% tax deduction for pass-through income, a doubling of the estate tax exemption, lower ordinary income tax rates, and a more generous alternative minimum tax will send 65.3% of the bill's individual benefits to people in the top 20% of the income spectrum, with the top 1% getting a $50,000 tax cut on average in 2018. As the years go on, the value of tax breaks shifts further toward the top. And hedge fund managers in large part kept their carried interest provision, which Trump had promised to eliminate. --A previous version of this story misidentified Pew Charitable Trusts in graf 7.